A LimeBike dockless bike share bicycle in Milwaukee. Photo by Dave Reid. While the City of Milwaukee fights dockless scooter operator Bird in court for a violation of state law, the city is also moving to legalize dockless bicycle sharing. The rapidly proliferating technology allows users to rent bicycles with a smartphone, picking them up and dropping them off wherever there is space available on city sidewalks. 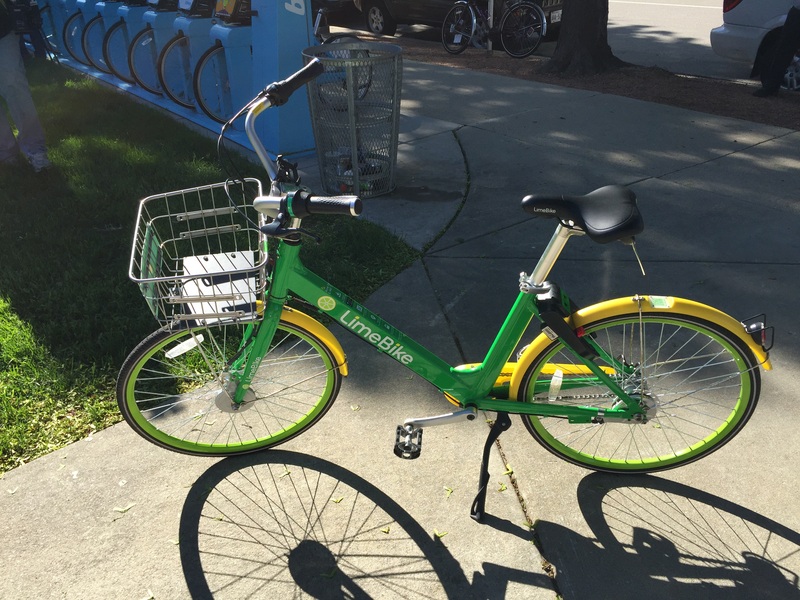 The Common Council’s Public Works Committee unanimously approved a resolution Wednesday morning supporting the Department of Public Works‘ efforts to create a pilot program for dockless bike sharing systems to operate in the city. The effort is being led by newly-hired DPW Multi-Modal Manager Michael Amsden. Docked bike share, which is the system style that non-profit Bublr Bikes runs, relies on riders taking bicycles from dock to dock. Meanwhile, representatives of for-profit operator LimeBike have been meeting with city officials about getting its dockless technology legalized in the city. Amsden anticipates launching the pilot program in August. It will contain a basic framework for allowing the systems to operate in Milwaukee, while also advancing a number of equity-focused goals to encourage the systems to provide bicycles for all city residents. The program is anticipated to allow a base fleet of 250 vehicles, including electronic-assist bicycles that give the rider a boost while they’re pedaling. Permits for an additional 150 bicycles per operator will be issued if the operator can ensure that its bicycles are spread evenly at the start of each day throughout the city, which the Department of Public Works will measure by creating five zones. Amsden said an increased fleet size will also be allowed if 10 percent of the fleet consists of adaptive bicycles targeted at people with physical disabilities. Amsden, the city’s first person to serve as Multi-Modal Manager, last worked in transportation planning in Chicago and said DPW has been scouring the country for best practices in dockless bicycle regulation. One component of the program will be a retrieval fee for bicycles that the city must move if they’re parked illegally or found inoperable. In order to help mitigate this problem, and the potential clutter from bicycles on the sidewalks, the program will offer incentives to the company to have bicycles that can be locked. “All of this is evolving so rapidly that we do look at this as a big research question,” said Amsden. In response to a query from Alderman Michael Murphy about companies that operate outside of the pilot program, committee chair Ald. Robert Bauman noted that a companion ordinance would allow the city to impound bicycles from non-compliant operators. The pilot is scheduled to sunset at the end of 2019. The full Common Council is scheduled to consider the program at its July 31st meeting. Yet we can’t have Bird Scooters? Silly. Same difference. These bikes can be tossed anywhere and left on public walkways. Sometimes I really question city officials..
Dockless bikes seem to be the future because of its flexibility, but I wonder if it will make the Bublr docked bikes less viable down the road. I was recently in Charlotte, NC, and they had a docked system (Trek based like Bublr), but there were also four brands of dockless bikes over the city. Dockless bikes everywhere. City regulation is going to be important to keep Bublr from going under and minimize bike clutter over the city. The city of Milwaukee keeps painting more bike lanes and talks about being bike friendly but the condition of the streets and the lack of traffic enforcement make this city challenging for bike riding. Everyone knows what it is like to hit one of the many potholes in our cars but think of hitting that same one on your bike. Worse than the potholes are the cracks in the pavement which happen every twenty feet. These are the lines put in when originally paved years ago for expansion. The cracks have expanded and contracted for years and now just stick up. Then there are the driver’s who no longer obey red lights, stop signs, and speed limits. I live on the NW side which gets no police patrols and the diver’s know it. On a recent ride up 92nd street, (nicely paved and with a bike lane) I watched as cars did not even slow for red lights at Fond Du Lac, Mill, and even Good Hope. Cars will travel at speeds exceeding 60 miles an hour. The Oak Leaf trail is not even usable in this area,it is in such bad repair. So enjoy your 250 new bikes downtown, hopefully they will never reach the outskirts of the city. I see no reason we can’t add Bird scooters to this. I was in Seattle last year and these dockless bikes were EVERYWHERE! I am all for getting people to ride bikes but these were seriously all over the city. Downtown had piles of them sitting next to each other. Rural areas had them on misc. corners of residential neighborhoods. It was a complete mess. I wonder what happens to all the damaged ones too. I can already see piles of discarded broken down bikes. This idea is just silly. According to the independent City Attorney’s office, the scooters cannot be legally operated on city streets because of the state statutes that govern vehicles operated on the public right-of-way. The state law, which municipalities are required to adopt uniformly, requires vehicles to have an ownership title, be registered, and meet certain safety standards. Certain vehicles, like bicycles, Segways and various agricultural vehicles, are exempt from such regulation. “There are a whole host of exceptions, and Bird’s motorized scooters are not one of them,” said Stephens. An article on the differing rules between dockless bikes to dockless scooters would be helpful. More obstructions on the sidewalk? Sidewalks are not parking lots. I support bicycling and bike share. I say this as a bicyclist. I do not support bird scooters or bicycles left on sidewalks – with no designated areas for them when not being used. This is unsafe and creates obstructions in public spaces. I do not want to invite future, private companies to “leave” money-making objects in the street – especially in public spaces. Now, if the city had tax-payer funded bicycle share program that was “free” for anyone – that is a totally different conversation – but still the concept of leaving things on sidewalks in an unsafe practice and should not occur. I’m a big fan of putting more bike sharing in place to promote biking and livability of downtown and surrounding areas, however I’m a little bit nervous about what that will mean for bublr bikes. Their system has been so successful, especially for a nonprofit and I’d hate to see it go by the wayside. Great! More crap littering our city, obstructing sidewalks, etc, etc, etc…. Abandoned property is just that. Abandoned. If I find one unattended and unsecured, it will become my property! I’ve already had to move three abandoned Bird scooters from the sidewalk (public right of way) because they were impeding pedestrian (me) traffic. Can I park my car on the sidewalk? Of course not. bicycles and scooters are no different. Bublr bike docks are the best solution for our city. Lime & Bird should me held to the same standard. If I find of these parked on the sidewalk outside my Condo unattended for days then I too will keep it!Can Milwaukee get anymore stupid than it already is?